If you follow gold/silver companies and the HUI Index, you may have wondered what stopped the rally cold in September. Things were finally going in the right direction and whamo, out of nowhere, the rally ended. Not only did the rally end, but it also continued to slide downward. Obviously, something happened. According to high-profile fund manager Evy Hambro, chief investment officer of BlackRock’s natural resources equity team, the mining sector is at the moment “rife with investment opportunities.” These opportunities, arising from expected supply shortfalls, should help spur a recovery in share prices after a sustained period of weakness, he said in a note to clients. Mr. Hambro heads several funds for BlackRock, which manages assets totaling around US$3.7 trillion. When Barclays Global Investor UK Holdings merged into Blackrock, Blackrock became one of the world's largest institutional shareholders, usually having the largest holdings in a company when considering the holdings of its seven divisions. 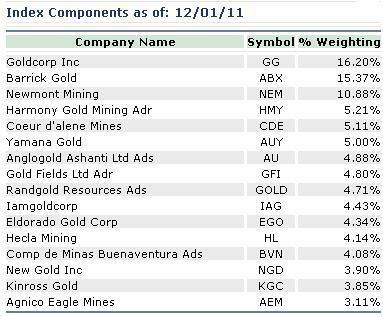 So I started looking into their current holdings in copper, gold and silver companies. This is where I was amazed! It looks like either Hambro didn't get the memo, or Blackrock's actions do not match its words. We can now see what happened in September, because Blackrock's 13-F SEC filings for 9/30/2012 were finally filed 11/13/2012. That was only two days before the article about Hambro. These are currently the component companies of the HUI Index, and their weightings. It's pretty obvious the first thing to do to stop a rally would be to attack the top components. Two out of three would do. Someone at Blackrock made some phone calls. How else would you explain the following coordinated actions shown in these reports put together from Blackrock's latest 13-F SEC filings. Blackrock dumped over 68 million shares of Goldcorp (report) and over 57 million shares of Barrick Gold (report). These two companies make up almost 1/3 of the HUI index. The right-most column in these reports show the number of shares sold or added since the previous quarter. You can see the co-ordinated sell-off from all seven Blackrock divisions, as well as the overwhelming volume of shares sold. That's what caught my attention. For some reason, Blackrock must have been in a real panic when the HUI started its climb. Perhaps it's because Blackrock is JP Morgan's largest shareholder, when considering all seven of Blackrock's divisons. 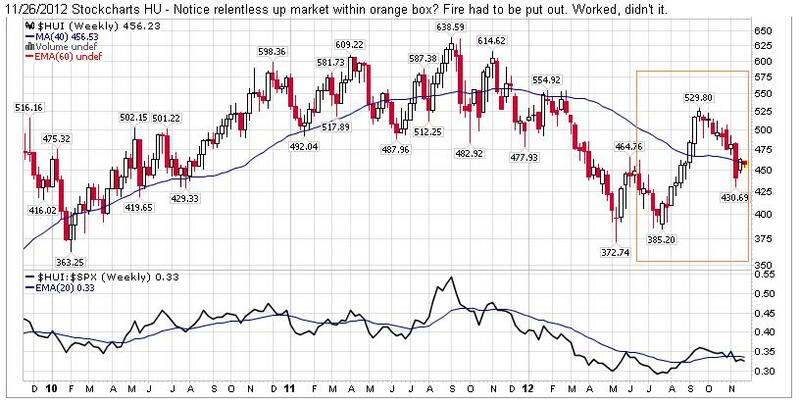 By the way, in fairness, you'll also find the major buyers in theses charts, too. It is noteworthy the size of the total shares that didn't find another home. Perhaps they went into private hands. Notice the drop, in just one quarter, of 57,794,806 shares of Goldcorp that are no longer held by institutions. Also attacked were these HUI companies (in alphabetical order). Click on the company name for its report. For whatever reason, Newmont Mining (report) wasn't attacked, and their report shows somewhat normal trading. Interestingly enough, the other companies in the HUI Index seem to be trading somewhat normally, that is, no extremes and some Blackrock divisions were actually increasing their share holdings. Here's a list of the Blackrock divisions (in order of total holdings) for a list of their holdings in precious metal companies, as well as how much they sold and bought in the 3rd quarter. Click on the company name for its report. Of course, there is no manipulation of our "free markets". Blackrock's recent actions have got to drive technicians nuts. Perhaps this is about "painting-the-tape".